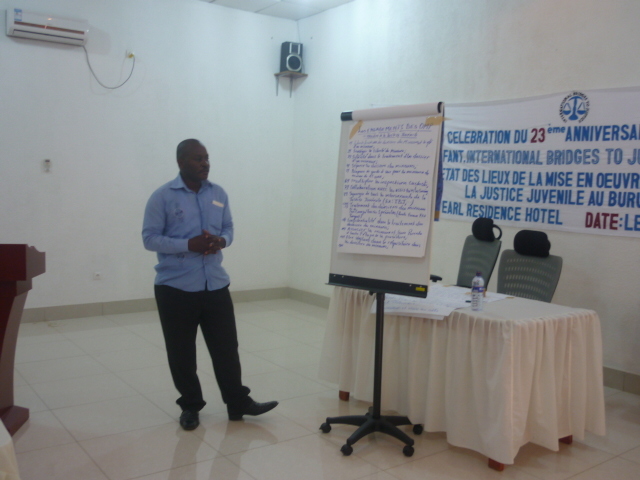 While celebrating the 23rd anniversary of the Convention on the Rights of the Child and Universal Children’s Day (November 20th), IBJ organized a roundtable event around the theme “special procedures of juvenile justice enforcement in Burundi” on Friday, November 23rd, 2012. 20 people participated, including presidents of courts, prosecutors of the republic, judges, secretaries, and court clerks. 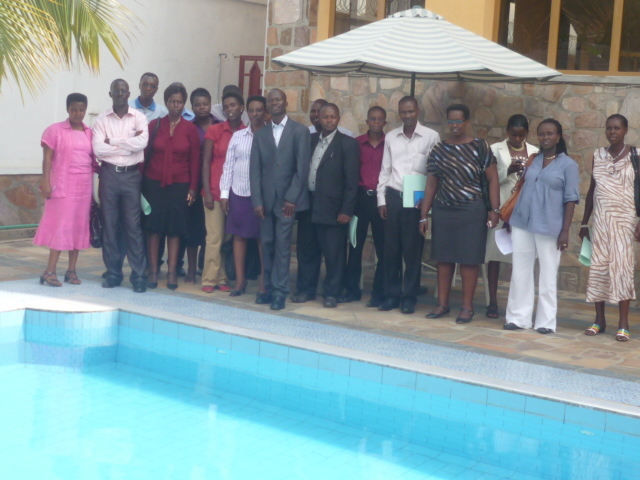 All journeyed from the city of Bujumbura and the provinces of Bujumbura, Bururi, and Muramvya, the three main provinces in Burundi from which IBJ provides free legal assistance to women and children in conflict with the law. This event took place a year after IBJ organized a similar roundtable on the same topic. Taking a collaborative format, this roundtable was organized to evaluate how criminal justice stakeholders are dealing with matters relating to children, how they are implementing what they have committed themselves to doing, and what can be done to improve collaboration as well as speed up the treatment of juvenile offenders’ cases going forward. The Convention on the Rights of the Child, which has been incorporated into the Burundian constitution (article 19), states that with all decisions concerning the child, the best interest of the child must be taken as the most important consideration (article 3 of the CRC). 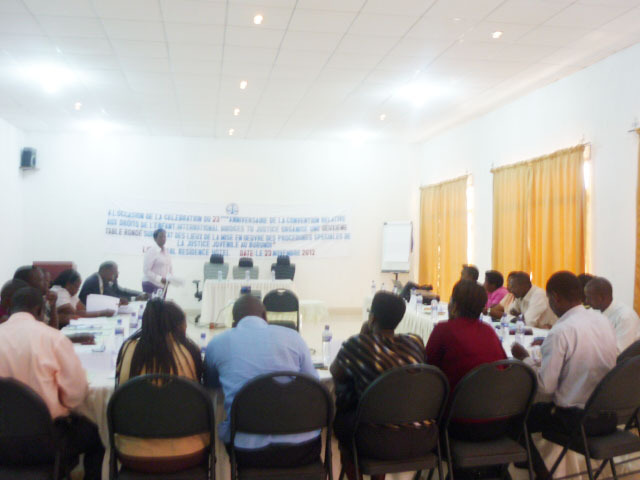 With this statement began the task of getting the audience to notice that, in accordance with the Convention and Burundian constitution, detention of the child must be prevented as often as possible. Aline Nijimbere, IBJ legal fellow, had the participants think about the scenario “what if you had committed or been suspected of committing a crime at a young age and then were jailed?” According to Aline, it would have been impossible for most of the participants to have the same role as the one they currently have in society if this statement was true. Then, in addition to the example mentioned, the roundtable also noted that juvenile justice goes way beyond simply organizing society by the rule of law. It is also a matter of value judgment. This is why all participants had to focus their attention on what can be done to avoid the insufferable imprisonment of children, and if there is no other solution, then how to deal with such cases involving children. Exchanging ideas on the issue being discussed, the presidents of the courts of Muramvya and Bururi each shared experiences on how they have been implementing procedures of juvenile justice in partnership with IBJ. Then, as a whole, the roundtable network of stakeholders came to the conclusion that it would be feasible to advance the rights of children in conflict with the law through individual and shared commitments. Not only did participants commit themselves to changing their ways of enforcing criminal provisions protecting the child, but also, they found the importance in working to bridge the existing gaps that may be present due to lack of collaboration. They agreed that setting up a solid network and laying a functioning chain of actors, starting with the prosecutor who conducts questioning of the child after the arrest stage, all the way to the judges who sit in trial, are both important and possible. Then, in their individual commitments, the secretaries for the prosecution and the court clerks committed themselves to distinctly classifying the files of children and entering the information rapidly for all documents concerning children’s affairs. Urgency will be applied while transmitting files to courts whereas prosecutors will avoid, to the extent that they can, issuing warrant of arrest and calling for heavy penalties against children in conflict with the law. To follow the example of Bururi and Muramvya, all judges committed to holding regular special “in-camera” hearings for children. Hopefully, these minimum standards guiding juvenile justice are going to be observed. Amazed by this short, energizing event that will lead to a new age of juvenile justice in Burundi, IBJ will support the implementation of the commitments raised through the roundtable until they become a reality. The biggest recommendation participants agreed upon is tightening the collaboration of all justice stakeholders in promoting and protecting the rights of the child in conflict with the law, and IBJ is committed to support this endeavor.